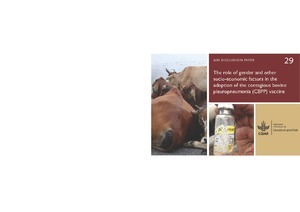 This paper focuses on the role of gender and other socio-economic factors in the adoption of the contagious bovine pleuropneumonia (CBPP) vaccine. The study responds to three questions: What socio-economic factors affect the adoption of the CBPP vaccine? How do they affect the adoption? What can be done to enhance the adoption of CBPP? The study pays special attention to gender as a distinct socio-economic category because communities often use gender to define differences between women and men, and to justify, sustain and reinforce inequalities between women and men with the resultant subservience of women. Answers to these questions were obtained through a review of literature on CBPP and technology (including vaccine) adoption studies. Technology, including vaccine, adoption is gendered, with women tending to adopt less than men, especially in terms of consumer associated drivers (accessibility, affordability and acceptability) referred to by the authors as the 3 As. Other socio-economic factors, such as class and geographical location appear to have a greater influence than gender in terms of political and market based drivers of vaccine adoption. campaigns, simultaneously, in pastoral communities living in marginal areas.